From the pages of Randy Frazee and Max Lucado's retelling of Biblical narratives in The Story, a spectacular recording was created. This collection includes songs written by Dove Award-winning artist Nichole Nordeman and Dove Award-winning producer Bernie Herms, and performed by a virtual "who's who" of Christian artists: Amy Grant, Chris Tomlin, Natalie Grant, Steven Curtis Chapman, Francesca Battistelli, and a dozen more. Featuring 13 songs from this extraordinary recording, the selections include both solos and duets and are accessibly arranged for medium voice. Each song is written from a first-person perspective, and recounts the struggles and victories experienced by various Old and New Testament characters such as Job, Ruth and Naomi, Moses, David, Mary Magdalene, and Paul. Songs include: Bend (Joseph - by Brandon Heath) * Born for This (Esther - by Mandisa) * Broken Praise (Job - by Todd Smith from Selah) * I'm with You (Ruth & Naomi - by Nichole Nordeman and Amy Grant) * It Must Be You (Moses - by Bart Millard from MercyMe) * Who But You (Abraham & Sarah - by Mark Hall and Megan Garrett from Casting Crowns) * Your Heart (David - by Chris Tomlin) * Alive (Mary Magdelene - by Natalie Grant) * Be Born in Me (Mary - by Francesca Battistelli) * The Great Day (Second Coming - by Michael W. Smith and Darlene Zschech) * How Love Wins (Thief - by Steven Curtis Chapman) * Move in Me (Paul - by Jeremy Camp) * When Love Sees You (Jesus - by Mac Powell from Third Day). 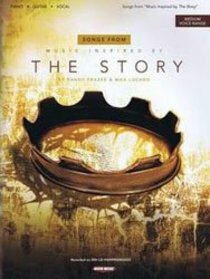 About "Songs From Music Inspired By the Story (Music Book)"
From the pages of Randy Frazee and Max Lucado's retelling of Biblical narratives in The Story, a spectacular recording was created. This collection includes songs written by Dove Award-winning artist Nichole Nordeman and Dove Award-winning producer Bernie Herms, and performed by a virtual "who's who" of Christian artists: Amy Grant, Chris Tomlin, Natalie Grant, Steven Curtis Chapman, Francesca Battistelli, and a dozen more. Featuring 13 songs from this extraordinary recording, the selections include both solos and duets and are accessibly arranged for medium voice. Each song is written from a first-person perspective, and recounts the struggles and victories experienced by various Old and New Testament characters such as Job, Ruth and Naomi, Moses, David, Mary Magdalene, and Paul. Songs include: Bend (Joseph - by Brandon Heath) * Born for This (Esther - by Mandisa) * Broken Praise (Job - by Todd Smith from Selah) * I'm with You (Ruth & Naomi - by Nichole Nordeman and Amy Grant) * It Must Be You (Moses - by Bart Millard from MercyMe) * Who But You (Abraham & Sarah - by Mark Hall and Megan Garrett from Casting Crowns) * Your Heart (David - by Chris Tomlin) * Alive (Mary Magdelene - by Natalie Grant) * Be Born in Me (Mary - by Francesca Battistelli) * The Great Day (Second Coming - by Michael W. Smith and Darlene Zschech) * How Love Wins (Thief - by Steven Curtis Chapman) * Move in Me (Paul - by Jeremy Camp) * When Love Sees You (Jesus - by Mac Powell from Third Day).